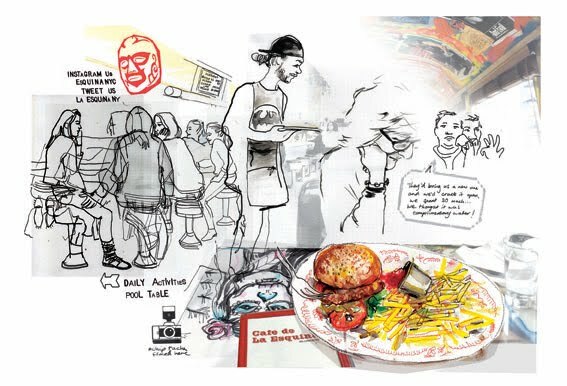 Cherie Jerrard, an artist based in Shrewsbury, UK, uses urban sketching as an antidote to her career as a fashion illustrator. She is particularly interested in everyday reportage sketches of cafe culture. She says, "I find cafes and coffee houses the best source for gaining an insight into people's lives as they relax and chat with friends." 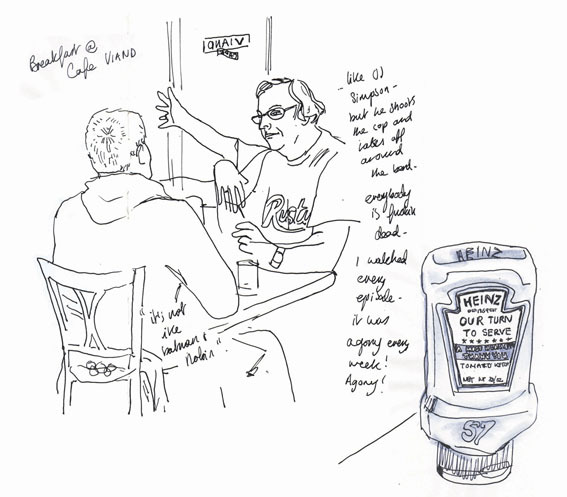 Her upcoming exhibit, #cheriedidthis - reportage illustrations documenting the cafe culture of our time, just opened at The Coffee House, Shrewsbury, on January 25, 2016. The exhibition will move to Ancoats Coffee Company in Manchester during April, where it will be accompanied by illustrations documenting the coffee roasting process they do onsite. 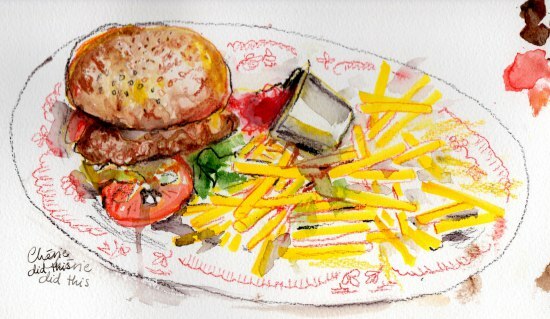 USk editor Marcia Milner-Brage curated a selection of Cherie's work for this post. Fernandez & Wells on the grounds of Somerset House, London. Cherie zeroed in on a pensive moment at the same London coffee shop, Fernandez & Wells, pictured above. Cherie calls this "time-lapse illustration." At Cafe Viand in New York, Cherie comments, "Sometime what you hear is just as profound as what you see. Conversations can provide an audible insight while your eyes are busy soaking up the visuals. Sketching anchors me in the moment." 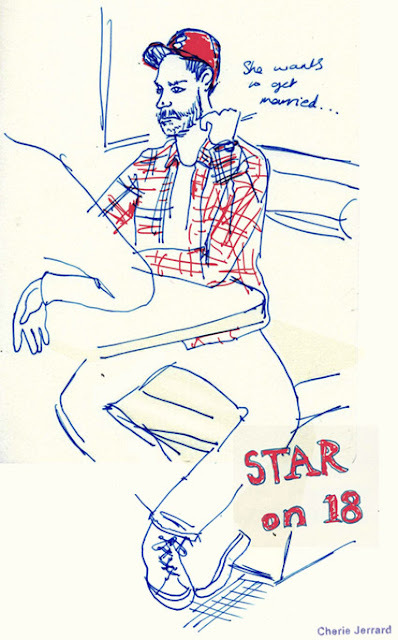 At another New York diner, Star on 18, "this fella was so emotional his mate did little but nod and ask for the bill." Below, also in New York, kitchen staff take a break at Fresh & Co on Broadway. "As a big fan of diners, brought up on a diet of Americana, I was a kid in a candy store at La Esquina in Williamsburg, Brooklyn. I wish I could eat this jalapeño and pineapple burger right now!" Sometimes, Cherie Photoshop collages several drawings together with a memento or two and snippets of photos. "To get a good cross section of cafe culture when in New York....just around the corner from Times Square was Deli Cafe." 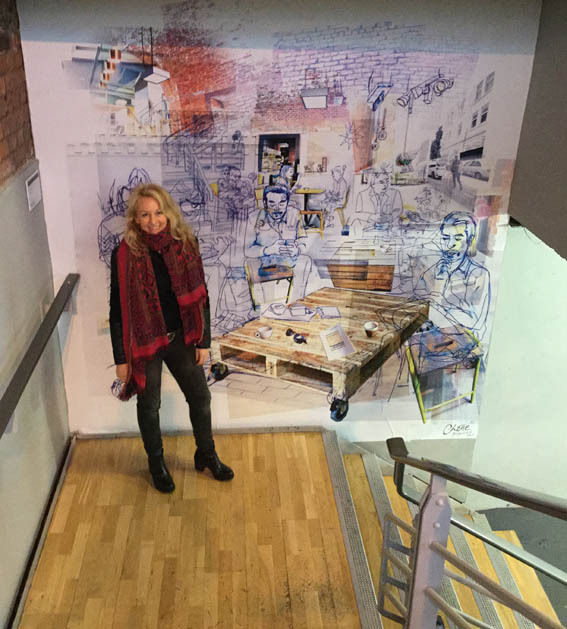 Cherie has an installation piece based on one of her composite, collaged cafe drawings at Grindsmith, in Deansgate, Manchester, UK. Last year she completed an MA in Illustration at Manchester School of Art. 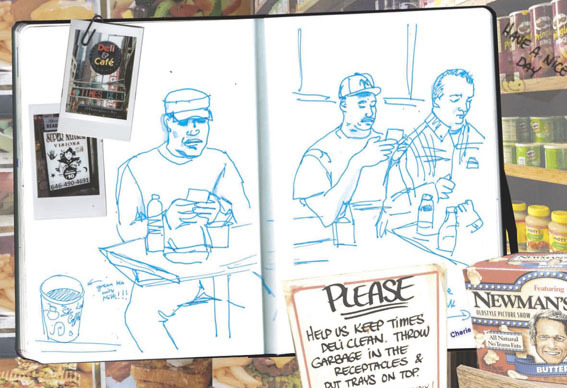 Cherie was a finalist in the Moleskine Reportage Award 2015 for some of her cafe culture sketches. Subsequent to the Moleskine award, Lamy was kind enough to send her some of their pens and sponsor the making of a newspaper. They are available to buy online but 100 of these newspapers will be free at the exhibition.